As we move further from the misty past and closer to modernity in our exploration of the endgames of world championship matches, we come to the battle between the incumbent champion, Jose Raul Capablanca, and the challenger, Alexander Alekhine. The world championship match was held in Buenos Aires, Argentina, in 1927. Capablanca, who we met last week when he took the championship from Emanuel Lasker, was considered to be the heavy favorite of the match. Alekhine had never defeated Capablanca and his record prior to the match was five losses and seven draws. Little did people know then that many matches for the world championship would be won by players who had never before defeated their opponent! Petrosian (against Botvinnik), Fischer (against Spassky), and Kasparov (against Karpov) are some of the examples. But at the time Capablanca was considered practically invincible, and few believed that Alekhine had any chance. The beginning of World War I found Alekhine playing in a tournament in Germany. At the outbreak of the war, the Russian players were taken prisoner. 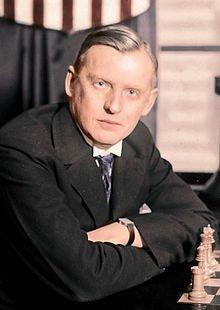 Later Alekhine was released and returned to Russia, after which details of his life were shrouded in mystery. He apparently returned to the front, and also performed simultaneous exhibitions in military hospitals. After the Bolshevik Revolution, he was taken prisoner in Odessa, and was in danger of being executed. The details are unclear, but somehow he avoided that. In 1921 he defected from Russia and moved to France. Throughout the early 1920s, he competed in international tournaments with great success, which allowed him to seek a match with Capablanca. It has been said that Alekhine was able to defeat Capablanca by improving his technical ability and restraining his wild imagination, in effect beating Capablanca at his own game. Indeed, in this match you hardly see the wild and sharp play typical of Alekhine's chess. Alekhine understood that to attempt to defeat Capablanca in the style that he beat other masters would only backfire, that his energy would be used against him. Instead his play was strictly positional and his attacks very subtle. Despite this, the decisive games of the match are among the most celebrated world championship games today. Quite a few games where Alekhine had White reached the following ending, which arises from the -- aptly named -- Capablanca Variation of the Queen's Gambit Declined. Despite Alekhine managing to create a little pressure in some of the games, they were all drawn. Although of interest, none of these games really provide the right material for an article. 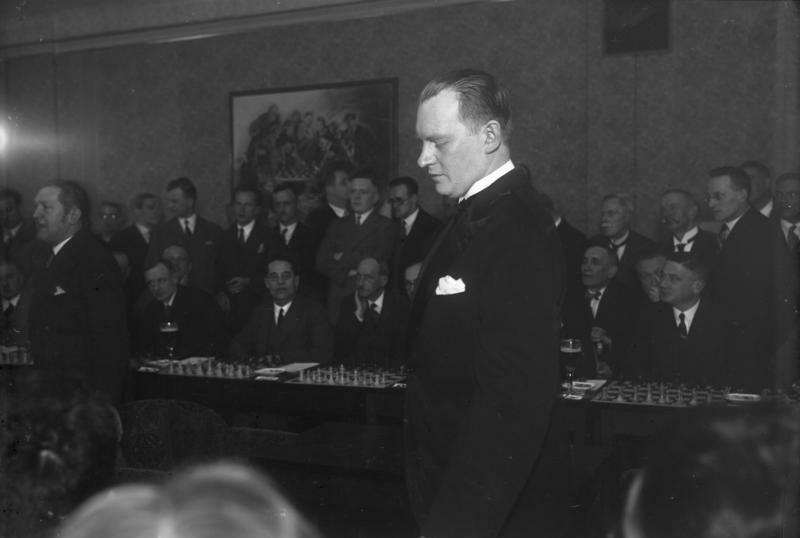 This game put Alekhine ahead by score of 5-3 (draws not counted), and on the verge of gaining the crown -- the rules of the match were that the winner was the first to reach six victories. However, according to some historians, the match would go to Capablanca in the event that it was ever tied 5-5. If this was true, then the score at this point was hardly such a big advantage for Alekhine -- he would need to win one game to become the world champion, but Capablanca would still only need two wins to retain the title. We move ahead to the 34th -- and final -- game of the match, the game that made Alekhine the world champion. With Alekhine needing only one win to finish the match, he once again played 1.d4, and the game went into another Queen's Gambit Declined. Perhaps tired of seeing ...Qb4+ followed by a dreary ending, he did the logical thing, and cut out that possibility entirely by playing 6.a3! Subtle positional pressure finally netted Alekhine a pawn on the queenside. Now imagine the tension -- winning this position would make him the world champion. He was tantalizingly close to his life's goal. But a real professional and real competitor cannot afford to get shaky and lose his nerve. Now let's see how Alekhine guided his advantage home, finally forcing the capitulation of the seemingly unbeatable Capablanca after 82 moves. This endgame is in itself a real course on rook and pawn endings. First of all, while the queens were still on the board, we saw many instructive situations where the players offered or rejected various exchanges. Correctly assessing the changes caused by the exchange of a pair of pieces is crucial. Finally, in the rook ending we saw a variety of typical themes, with Alekhine's slight inaccuracies perhaps making the ending only more interesting and instructive. We saw one of the most critical aspects of this ending -- the position of the rooks. Hopefully, you now have a much stronger sense of the real advantage of having a rook behind the passed pawn. We also saw Capablanca's defensive plan -- the exchange of the positions of the rooks. There were also themes of how a rook solidly defends the pawn chains while itself anchored (the black rook on f5), and some zugzwangs. In the end, we saw another basic motif of rook endings: the creation of a barrier to the opposing king.